Before building your dream home in Thailand you will need to find some land and decide how you wish to have control over it, for this there are several options of which most may not suit you, generally as a foreigner you are not allowed to purchase land in your own name, other than having it in your Thai wife's name we have listed several other options below. If you do decide to own the land or house in your Thai wife's name you really do need to take into consideration the actual laws of Thailand and if and when they may enforce these laws, a good example can be found here. You are able to lease land in your own name for up to 3 years, for this all you need is to sign the lease agreement with the owner and 2 witnesses and the land is yours for 3 years, if you wish to lease for any longer than this the lease agreement has to be registered at the local land office. With any lease over 3 years the land owner will be liable for taxes to be paid to the Revenue Department. You are able to register the lease for a maximum period of 30 years, multiple pre-signed leases, ie 3 + 3 years or 30 + 30 years are probably not a good idea as they would be extremely hard to enforce if the land owner decided against it, or the land owner dies and the ownership of the land or property changes hands. Lease agreements can be either in Thai or English, but please remember if there is also a signed Thai copy this is the one that will take precedence if there is any reason to take court action unless it is stated in the agreement that the English language version prevails (the so-called, "Governing Language" provision). From most Thai bookshops you can buy a book which contains about 60 standard lease agreements in Thai for less than 100baht, these are standard Thai leases without any special provisions so suitable for most people. Usufruct now seems one of the most popular ways to own land in Thailand for foreigners, ie it can be classed as rent free and tax free for the rest of your life, under certain conditions you may sub lease the land or buildings, you can read more about Usufruct here. Forming a Thai Company used to be the favoured route for foreigners to have control over their land, over the last couple of years though there have been threats of clamping down on this. With a Thai Company there has to be 7 share holders, only 49 percent of the shares may be foreign owned, a nominal tax of 10,000 to 15,000baht per year is generally paid to show that the company is active, generally the other 6 share holders will have pre-signed documents giving you control of their shares which leaves you in full control. You can read on how to form a Thai Company here. The Thailand Elite Card costs a cool 1 million Baht, this will enable you to buy some land in Thailand, a few free games of golf, a couple of free taxi rides, no visa run woes, free use of the first class departure lounge at Bangkok airport, and of course fast track through immigration. You can read more about the Thailand Elite Card here. Which ever route you decide on to be able to purchase your land in Thailand do make sure that you consult with a reputable lawyer, it could save you a small fortune in the long run. For general questions on building you can ask in TeakDoors Construction Forum, and for general questions regarding Thai law you can ask in our Thai Law Forum. Quite often you may find a plot of land in an area that you like but the plot maybe too big for your needs, with something like this you could always consider sub dividing the land into smaller plots and selling off the plots you do not need, or maybe even develop them yourself, doing something like this ensures that the neighbouring houses that you overlook from your property are not eyesores or slum dwellings. In Pattaya the land department are supposed to complete within 30 days, the cost for each plot is 3,500baht, you will need to take the original land paper to their office, a copy will be made and the sub divisions will be drawn onto this, they will then send surveyors to your land to mark it out using small round concrete markers for boundry corners, you then take the original land paper back to them and they will issue you with the new land registration papers within a couple of weeks. In Phuket it is slightly different and you can read about it here. The first thing to decide is how high do you need your land to make sure that you don't get flooded, if you are not on a paved road you will have to take into account that once the road is paved it will be quite a bit higher than it is now, infill inm Pattaya costs around 100Baht per cubic meter, a 10 wheel Thai lorry will supposedly carry 10 cubic meters, so the cost is 1,000Baht per lorry load, if you reckon on a lorry carrying 8 cubic meters you will be nearer the mark, this price generally includes grading as well, in rural areas infill is less than half the price so it pays to shop around, also keep in mind that if you are building a swimming pool you will have a lot of spare dirt from that. You can read about allowing the infill to settle,or using piles, or digging down to the compacted dirt here. External doors, these have to be at least 2 meters away from your neighbours land, windows have to be at least 1 meter away, your roof may not overhang their land nor should rain water from your roof fall into their land, generally they will agree that your roof can go up to your boundry line as long as you put guttering up, but ensure that your neighbour agrees to this before you start building your roof, obviously if you have a large plot of land then these problems can easily be avoided. Whether you use an architect to design your new Thailand house, or an off the shelf plan, or a modified version of an off the shelf plan you first need to decide what you want out of your house, things to take into consideration are do you need an outside kitchen for all the spicy foods to be cooked as well as an inside European style kitchen, how many bedrooms, how many bathrooms, once you have a rough idea it is time to find an architect or someone to draw up from your rough plans so you can get them approved. Here you will find many different house plans, if you click on a house it will take you to web sites with various styles and designs which may give you some ideas on how to build your house, also here you will find other web sites, don't forget though that Thailand maybe a completely different climate to where you are from and protection from the heat and keeping your house cool is a main criteria for comfortable living in Thailand. Other choices of keeping your house cool in Thailand include high tech Solar Cooling, Passive Cooling and low tech roof extractor fans. Planning permission in Thailand is extremely cheap, in Pattaya we generally get the planning office at City Hall to draw up our plans in their spare time, a rough guide to cost is a 3 bedroom bungalow plans and approval is around 15,000baht, 6 bedroom 7 bathroom 3 storey mansion type building 40,000Baht, doing it this way means that building work can generally commence straight away. As this is an extremely popular topic we have devoted it its own page, click here to learn about Thai Air Conditioning. Before we start on building your house lets have a look at some traditional Thai teak wood houses as this may be of interest to some. You can buy old Thai teak wood houses and have them taken apart and rebuilt on your own land, if you have to transport the wood from a different province then I would suggest getting legal advice from a lawyer to sort out the paper work that is needed, the police are quite strict on the transportation of teak wood in Thailand and without proper paper work you may find your newly purchased wood confiscated. Old teak wood is highly resistant to insects such as termites etc due to the resin content, generally new teak wood is from young trees now a days and doesn't contain such a high content of resin so is not as resistant. This thread is about a teak wood house being built in Issan on the bank of the River Nan. A teak wood house being built in Jomtien. The intricate work that goes into building a teak wood house in Chiang Mai, or maybe just build a wooden guesthouse. Can this Thai house be built for 250,000baht? Nope, it can't, but this one could be built for less than 500,000baht. Building a shop house is pretty straight forward, these are generally built in rows with the end units being double units, normally just under 4 meters wide and 12 meters long, toilets under all the stair cases and a small 2 meter area extending from the back of the building which is normally turned into a Thai style kitchen, you can follow the build of one block of shop houses being built here. Depending on your soil conditions and how many storeys your house is will be the deciding factor on how deep, and how big you have to go, generally anything over 3 storeys will need pilings, as will anything built on reclaimed swamp or paddy type land. On TeakDoor there are several building threads that involve the use of pilings, this one is for a small single storey bedroom extension in Bangkok, the ground in bangkok can be very swampy, these pilings are forced into the ground in quite an unusual way. With pile driving if you have neighbouring buildings close to you you have to make sure that they are not damaged, there are a few tips here. Here is a thread on pile driving and the building of a block of shop houses in Jomtien, and here is a bungalow being built in Korat using normal footings. Insulating your house from the sun and the heat it generates is a major consideration, also remember that floors are generally tiled here so get wiped over with a wet mop most days which tends to destroy dry lined walls or plaster board walls as we call them in England. A popular choice here in Thailand is Q-Con blocks, these are extremely easy to work with and have good insulation value, they come in different thicknesses so if you wish to hide the pillars in your house this is easily done, they are very easy to cut just using a hand saw and very easy to drill holes into. You can read about other choices of bricks and blocks available in Thailand here. maintenance, but these are the cheapest. The next best thing are the aluminum framed windows, these use 5mm or 6mm glass which comes in various colors, clear is the cheapest, then brown, then black green and blue, these are very low mantenance, the aluminum comes in alloy color which is the cheapest, but for a slight bit extra you can get it in brown, black or white. UPVC, this comes in single or double glazing and is the most expensive, it is generally fitted with clear glass as this doesn't absorb the heat which is a problem with the brown glass if it has the sun on it. You can read about windows and glass work here. Doors come in 2 standard heights, 180cms which is too short and 200cms, make sure you specify to your builder that you want 200cms, they also come in 3 different widths, 70cms, 80cms and 90cms, again make sure you specify. Interior doors in Thailand start from about 500baht each, the only good thing you can say about them is that they are a door albeit a rather unattractive one, reasonable hard wood doors start from just over 2,000baht each, teak wood doors just over 6,000baht each, all the doors will need extra sanding down, your building crew may not realise that so make sure you explain it to them. More on buying and choosing doors here. As the doors in Thailand are hardwood so therefore very heavy you will find that the Thai carpenters will use 4 or more hinges per door to hang it, also things to think about are your door frames, these cost around 500baht and are extremely unattractive, so maybe some architrave trim round the frames or something similar to make it look that much better. More on skirting, coving and architrave can be found here. In Thailand concrete profiles or architrave is exceptionally cheap, these can easily and quickly be fitted on the exterior of your house around windows and door frames to high light and make features rather than just having boring flat walls, you can read more about concrete profiles and architrave here. 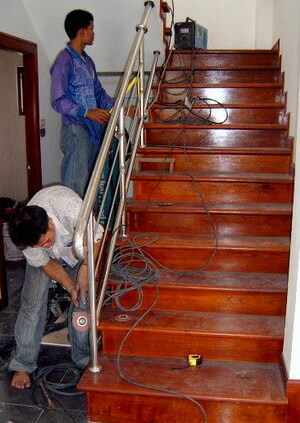 The building of stairs in Thailand is strictly unregulated, in shophouses you will find sets of stairs with different tread depths and heights (On one set of stairs), in most countries stairs have set tread depths and heights to make them safer to use, so make sure your Thai builder does understand this, it's very hard for a big footed farang to walk up stairs that have a 20cm tread and obviously dangerous, more can be read about stairs here. Your house entrance is the first thing anybody will see when coming to your house, so it's worth putting some thought into it, on this thread there are quite a few nice examples of what can be done. Thailand and Asia have an abundance of natural stone including marble and granite at extremely cheap prices, with a bit of forethought these natural products can help in keeping your home cool, more on Thailand's stone and stonemasons can be found here. Security grills and gates are extremely popular in Thailand for making your house secure, but many are quite an eyesore to say the least, with the choice of using steel or even stainless steel there really is no reason for this, all security grills in Thailand are made to the sizes and design you want and the price generally includes fitting, you can read more about Thai security grills here. Guttering is slowly becoming more popular amongst the Thai's, in Thailand you have the choice between galvanised guttering or stainless steel guttering, obviously stainless lasts a lot longer but is also quite a bit more expensive, you can read about the different types of guttering in Thailand here. Before even starting on the foundations for your house make sure you spend some time making sure your ideas and plans are actually what you want and that your builder understands exactly what you want and why, quite often a Thai builder will have what he considers a better idea and do that without informing you, yes, he maybe right that fitting that Thai squat toilet in your main bathroom will save on water usage but are you actually able to squat down and use it? More on bad planning can be found here and dangerous building practises can be found here. 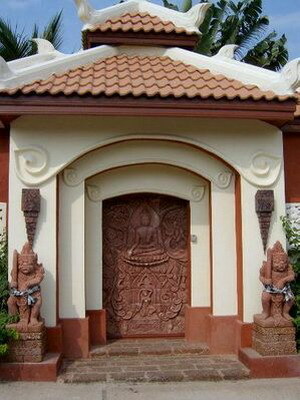 On occasions Buddhism may be brought into the building of your house, whether it means having the ground breaking day on some auspicious day decided by the local monks or the First Post Ceremony to give you and your family good luck, also your spirit house needs need to be decided upon, ie what type of spirit house and the placement of your spirit house. In building your house in Thailand you will be meeting and probably dealing with many Thai people, this maybe the time to learn about the Thai Wai and when, where and to whom you Wai, you can learn more about waiing here. Depending on where you have your house built in Thailand will decide on how you get water, some areas, ie main towns and cities will have municipal mains water supply which should be reliable enough as long as you have a storage tank as well, many places in Thailand though you will either have to dig a well or have a bore drilled, generally with deep bores you will only pay as long as they hit water which they seem to do most times, also checking out your neighbours wells or bores will be a good indication of how deep you may need to go and what if any water problems you may encounter. During the construction stage you will need to decide on your hot water needs, if you decide to use solar collectors you will need copper pipe runs put in from your hot water tank storage to your bathrooms baths and sinks, if you decide on water heaters you will need to run copper pipes from where the heater will eventually be installed, if you are going to use shower heaters then only the cold water runs need to be worried about, another consideration is the size of the pipes you need to run to your bathroom if you want to use big shower heads. Information on building cess pits including soak aways can be found here. If you have the land area it's a nice idea to build a guesthouse or maids quarters, you can find some ideas on that here. Decorating in Thailand is generally quite different to the rest of the world, non drip gloss is considered a new product here and painting is generally done using old style chemical paints that need thinning down, even down to filling holes things can be different to what your used to. Anyway feel free to have a look round our Construction Forum, you will find many informational threads on just about every aspect of building a house in Thailand, even down to the small stuff like fitting a toilet, drilling holes in bathroom wall tiles to cutting ceramic tiles, in our Famous Threads section you will find many completely finished building projects documentated including progress pictures, costings and other important information.